This may be the tackiest post I ever produce. But I had to show you my favourite (only) christmas jumper. On Friday it was Christmas Jumper day, the idea is you wear your christmas jumper to work and donate money to charity, all for a bit of fun. As Friday was the Christmas do, everyone was looking quite glam in work so they did it on Thursday. I ordered a suitably tacky, cheerful and cheap jumper from eBay over a week ago, with the promise it would arrive for the Thursday. It never did come in time. But I'm not out of pocket too much because I made this one for free. 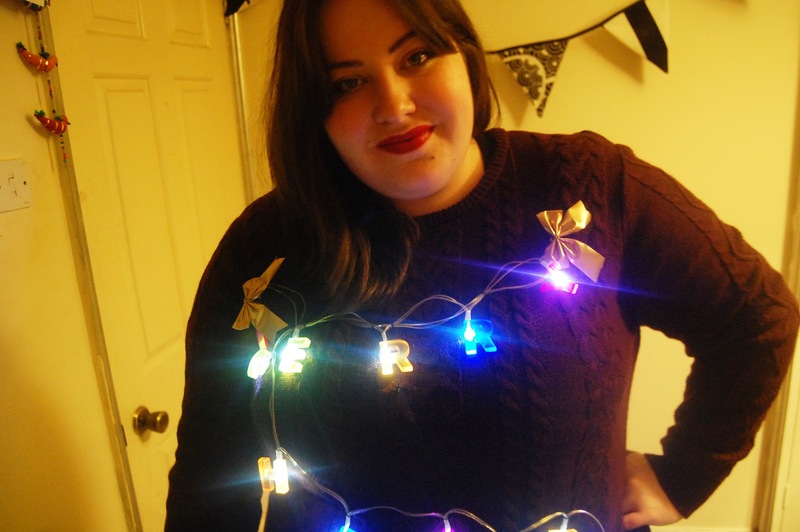 In my disappointment I wanted to make the best Christmas jumper to shame them all. 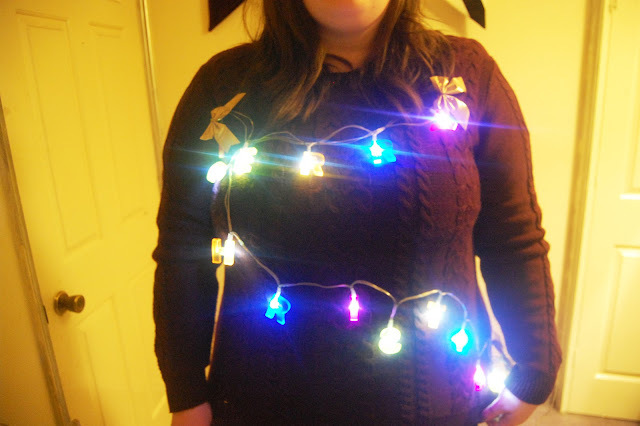 I had some battery operated lights, a jumper and some christmassy gold bows, and a needle and thread. I could do this. I made this Christmas monstrosity. It was a talking piece and I enjoyed 'flashing' people throughout the days with my lights. I actually never thought wearing a Christmas Jumper could be so much fun, but it was, so much so me and my colleagues got an email telling us to calm down and stop being so noisy. Bah humbug! I hope everyone else got to wear a suitably Christmas jumper at some point over the festive period! The lights do definitely say Merry Christmas in case you wear wondering! 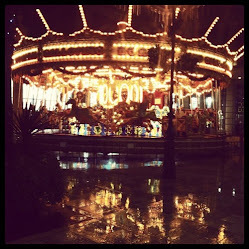 Edit: Sorry just mentioning, this is my 200th post! I think it's been celebrated in style! Jumper - Made by me. Uuuum... 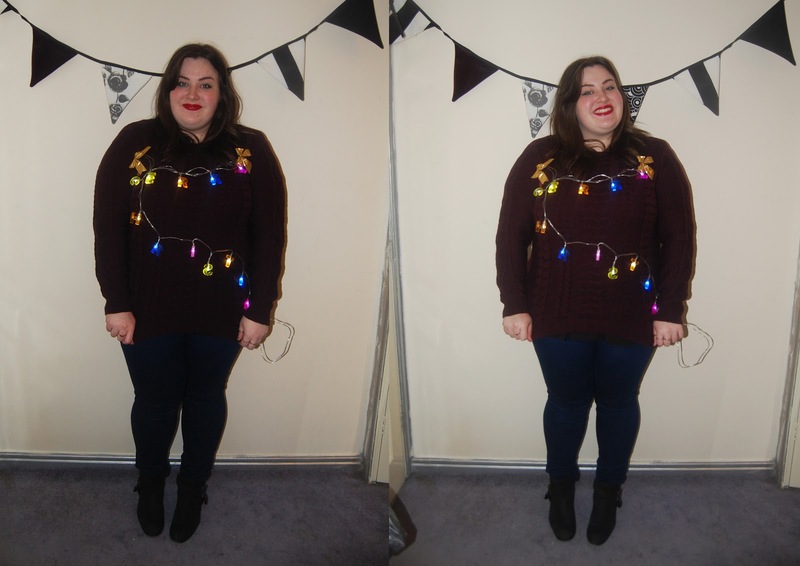 I want a fairy light jumper! !